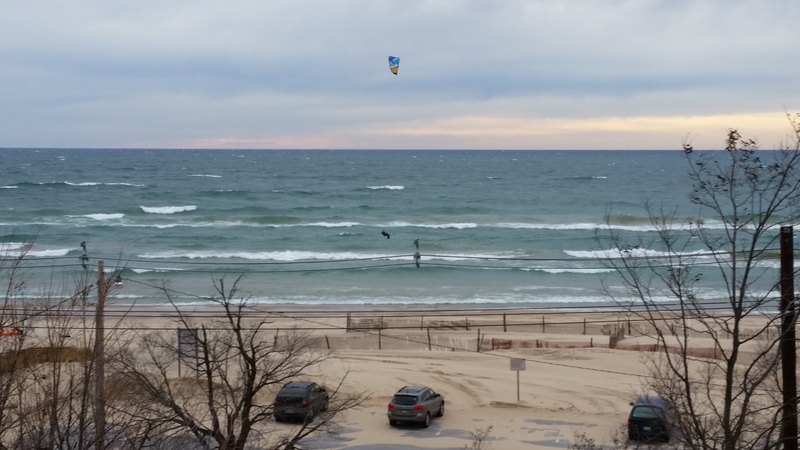 Last Weekend: Nailed It – Saturday there was a few hours mid afternoon where the wind came up enough for kiteboarding along the lakeshore out of the SW.
Well as far as accuracy of my forecasts goes, I continued to improve this year. I “Nailed It” the most this year yet with the total of 19 compared to 15 the previous two years. However, I do have 2 “Way Off” this year were as I did not have any last year. I have to say thank you to all of our readers. We continue to pick up new subscribers and had some of our biggest days yet as far as number of visitors that came to this site and viewed our webcams. Stay tuned for some posts this winter including top pictures of the year, some video we haven’t posted yet from earlier and hopefully some snowkiting updates. Today: After some pretty good wind this morning out of the west, it is really going to die off this afternoon. Saturday: Not going to be much wind at all and the breeze there is, will be from the SE. 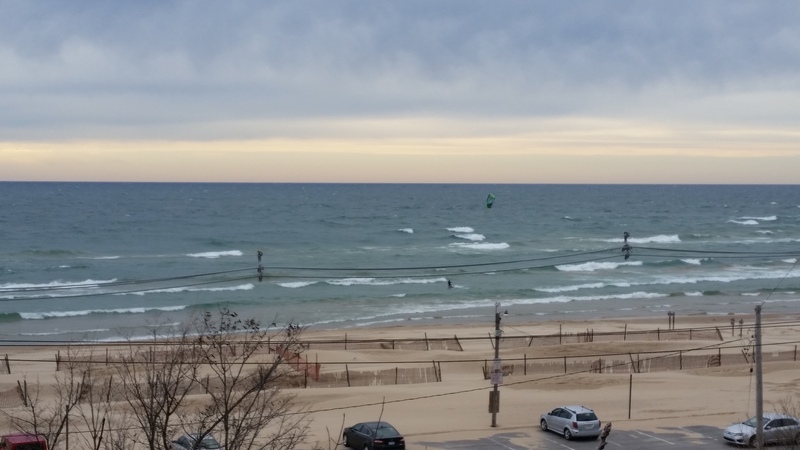 Sunday: Right now it looks like there is some potential, but that depends how much the wind will go from SE to S. If it does go S, it should be in the 15 to 20 knot range for the entire lakeshore. If it doesn’t go all the way S, it might still be rideable north of Whitehall to Meinert on a SSE. Yesterday I was able to get the afternoon off and do a downwinder. The wind was reading in the 27 to 32 knot range which is the very upper limit for me on my 8m Switchblade, but I didn’t want go on my 5.5m and then have the wind come down halfway through. Anyways, I rigged and took off solo from the north side of Port Sheldon. It was an awesome ride skimming the shoreline and carving the waves breaking all the way down. 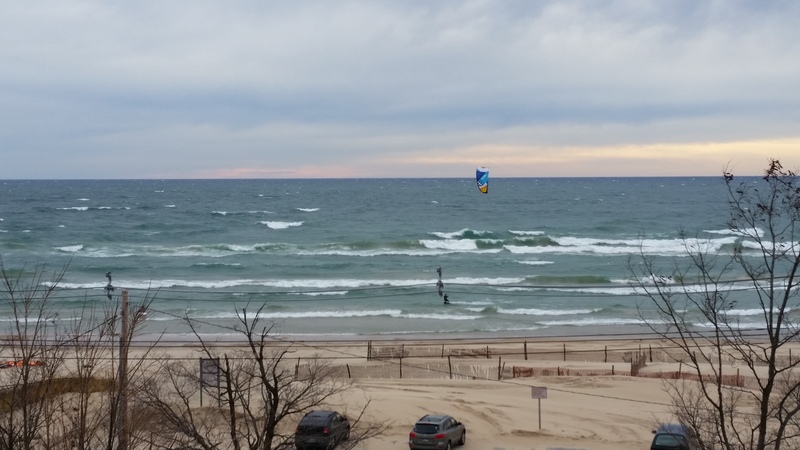 I felt like the 8m was the right choice most of the way until I got almost to Grand Haven. Right around Brucker beach I started feeling some huge gusts and almost got picked up off the water even with pushing the bar out! It was during a transition, so while I had the kite pretty high and above my head. 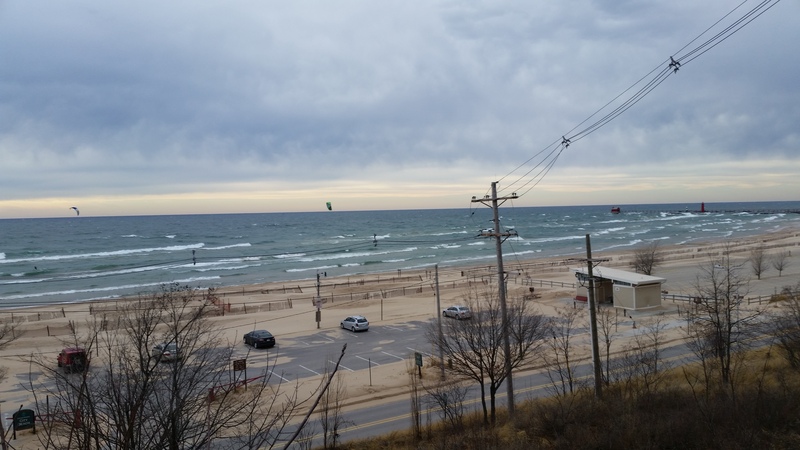 Then I was lit and all I could really do is ride downwind to my destination keeping the kite low and land. Still, it was a great ride and a great day! 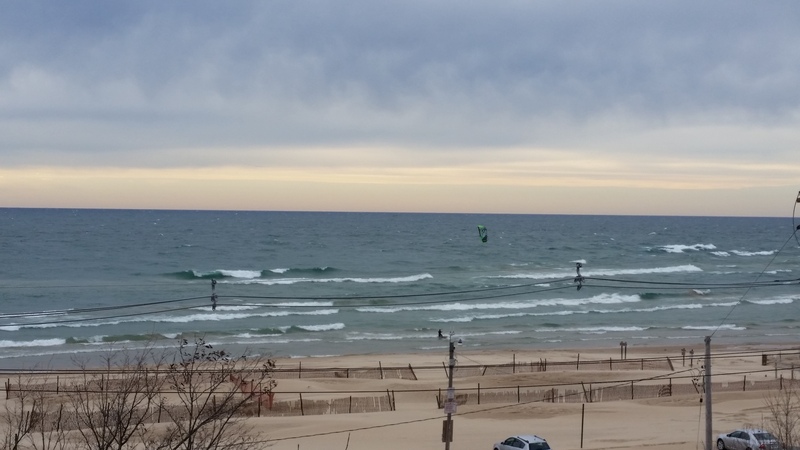 Two other kiters were rigging at city beach when I arrived and they were going out on a 7m and a 5m. I took some pictures as I was leaving.